"A lot of children died. That kind of stuff never leaves you." 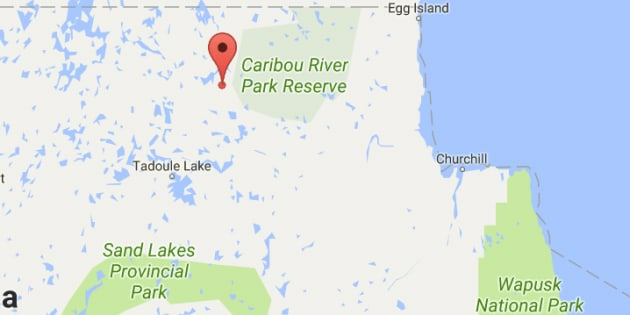 The Manitoba government will sign a piece of land near Duck Lake (marked in red) back to the Sayisi Dene First Nation. WINNIPEG — A northern Manitoba Indigenous community that was forced to relocate 61 years ago will be getting some of its traditional land back. The provincial government has signed an agreement to transfer 52 square kilometres of Crown land near Little Duck Lake to the federal government, so that it can be converted to a reserve for the Sayisi Dene First Nation. The community's 250 residents were forced to move to Churchill in 1956 after they were blamed for a steep decline in the caribou herd — an idea later proven untrue. In their new location on Hudson Bay, food was scarce, housing was inadequate and many residents died prematurely. The Manitoba government apologized for its role in 2010 and, last year, the federal government apologized and offered $33.6 million in compensation. The community's chief, Tony Powderhorn, says the land agreement helps address a long-standing wrongdoing. "It is a recognition that removing us from our land was wrong," Powderhorn said at a signing ceremony at the Manitoba legislature Wednesday. "It is an important step in reconciliation." A Sayisi Dene family is photographed near Duck Lake, Man. in 1947. The family members are Mary Ann Thorassie, Joe Thorassie, John Thorassie, Mary Cheekie and Moses Thorassie. Manitoba Indigenous and Northern Relations Minister Eileen Clarke said the forced relocation should not have happened. "They were relocated to areas devoid of the materials and resources that their people had always relied on. There was no adequate shelter, supplies or game to hunt." In 1973, the Sayisi Dene left the Churchill area and moved back near their traditional territory at Tadoule Lake. The 52 square kilometres that will be transferred is further north, near the former Hudson's Bay store where cargo planes were used to move the residents. "That's where everything started and happened," Powderhorn said. "We can probably go back and forth there (now), for maybe spring gatherings or something like that." The community's previous chief, Ernest Bussidor, was born one month before the relocation. When the federal government apologized last year, he recalled that many survivors of the relocation had suffered post-traumatic stress. "People freezing to death, fires, you name it," Bussidor said.